Isolated and serene, Maria La Gorda - Fat Mary is famed for its clear seabed, which many consider to be one of the richest in the Caribbean. Full of marine species and coral reefs of breathtaking beauty, ideal place to practice diving & ecotourism. Maria la Gorda is a lovely beach and the resort on the end of Cuba. Situated at the Currents Cape "Cabo Corrientes", which is formed by the long, curving Peninsula de Guanahacabibes, known as International Diving Center or haven for Bird Watchers. Loceted at the west end of the province Pinar del Rio, about 189 miles / 300 km west from Havana. The beach is named from the Venezuelan aboriginal beauty, abandoned here by pirates. Maria allegedly gained quite a reputation for her charms. She's long gone, but the Maria la Gorda’s sunsets are the best in Cuba. The area is filled with legends of pirates that are borne out by the anchors, old cannon and other treasures that lie on the bottom of sea near peaceful Corrientes Cove. Cuba's westernmost tip, the Guanahacabibes Peninsula, holds a true natural treasure characterized by exuberant vegetation, fauna and flora. Eco tourism enthusiasts can enjoy a wide range of options, trails: "Las Perlas Cave", "Forest Facing the Sea", "La Majagua" and "Hoyo del Palmar". Maria la Gorda at the Peninsula de Guanahacabibes has a remarkable avifauna a haven for bird watchers. The area has a remarkable avifauna ranging from Bee Hummingbird, the world's smallest bird, to several very rare species including some species which are virtually endemic to the island of Cuba. Wonderfully, it is possible to see almost all the birds in as little as a week by visiting Peninsula de Guanahacabibes, at the end of the Pinar del Rio province. The best birds watching spots are: • Currents Cape "Cabo Corrientes" • La Bajada • el Bosque • Hoyo del Palmar • Herbazal de Cienaga. Hotel Maria La Gorda has 55 cabins, which are equipped with all amenities demanded by modern tourism, so that they can enjoy their leisure time. Same of the cabins are located right on the beach, with magnificent ocean view. Hotel Facilities: two restaurants and bar, laundry, dive shop and snorkeling, cars and bikes rental. If you want to get away from city noises this is a good choice. The hotel caters primarily to divers, although it's also a good base for naturalists looking to explore the flora and fauna of the Guanahacabibes Peninsula, and the beach lovers. Maria la Gorda offer 39 diving sites of high level diving, some are still not named, all of them are less than hour cruise, some at even a few minutes away. The International Scuba Diving Center, has very friendly and experience divers’ team. They provide professional service for experience and inexperience divers, included Open Water Diver course. Dive cost: CUC$ 35 + $ 5-10 diving equipment rental. Here, you can see many species of coral, including the largest colony of Black Coral in Cuban waters; gardens of gorgonians; sponges; a large wall studded with grottoes; and Barracudas, Dog Snapper, Schoolmasters and other kind of Snappers, Marine Turtles. Maria la Gorda offer also fantastic snorkeling, incredibly there are colorful fishes right up to the water edge. Crab migration is an unusual occurrence and unforgettable spectacle, accrued every year in the Guanahacabibes National Park. 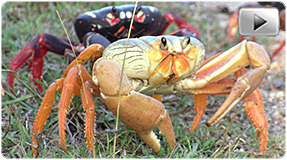 Crabs to make their long and difficult journey to the sea, must protect themselves from dehydration in the Caribbean heat, as well as traffic while crossing roads. A million years ago, crabs lived in the sea. Now days millions of crabs move to the shore every spring. They release the eggs into the sea, the eggs released by the females hatch immediately on contact with the sea water and clouds of young larvae swirl near the shore, before being washed out to sea by waves and tides. Gorgonian Garden "Jardin de las Gorgonias" depth : 15 meters 50 feet. A shallow garden with an abundance of gorgonians sponges and corals. Yemaya, depth :12 meters 100 feet. In the Santeria religion "Yemaya" is the Goddess of the sea. Tunnels purple vase sponges with colorful shrimps. Maria's Lounge "Salon de Maria" depth : 20 meters 60 feet. The reef formed by a hole in the rock, coral or sponge growth around the cave. Vanesa's Patio "El Patio de Vanesa" depth : 15 meters 50 feet. Couple of really big gouges in the reef. Pirate's Anchor "El Ancla del Pirata" depth : 18 meters 60 feet. Wall with wide sandy channels, barracudas, nice corals and spectacular gorgonians. Enchant "Encanto" depth :10 meters 100 feet. A wall with lots of tunnels and caves. Aquarium "El Acuario" depth : 6 meters 22 feet. Relaxing dive patchy reef, shallow depth , as swimming inside a very large fish aquarium. Lost Paradise "El Paraiso Perdido" depth : 30 meters 100 feet. Many big fishes, a wall dive.